DotFix NiceProtect provides the complex software protection for your application. When your software starts, the NiceProtect engine decrypts the code section, unpacks the resources and starts your application's code. Most parts of the engine are polymorphic. Each time when you press the "Protect" button NiceProtect generates the unique engine's code with unique and absolutely different code parts. All the parts are split to the assembler commands and obfuscated each time with different algorithm. It helps to protect your software from unpacking and analyzing. 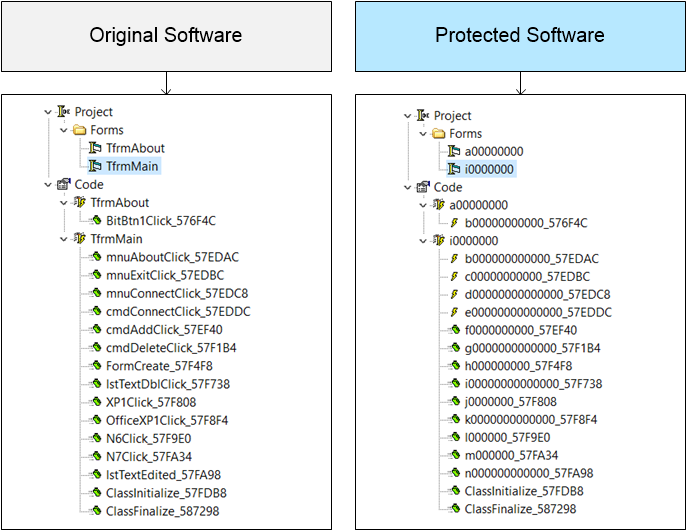 The DotFix NiceProtect engine also includes anti-tracing parts. If cracker runs your software under debugger the protected code starts working very slow and the anti-tracing engine detects it and terminates the decryption functions. Your files can't be debugged and unpacked without deep knowledge. DotFix NiceProtect also hides the startup code of your app to break unpacking tools and scripts. The startup code is obfuscated, virtualized and moved to the protection engine. The main feature of DotFix NiceProtect is the code virtualization. Using the virtualization markers you can mark any critical code during development. The software protection algorithm finds this markers automatically and virtualyze these parts. 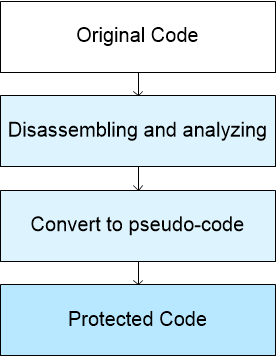 Some parts are converted to a pseudo-code to execute it using the NiceProtect Virtual Machine, the other parts are obfuscated (code mutation with adding garbage loops and conditions). Also you can protect the startup code of the critical functions using MAP file to avoid decompilation. Most decompilers work incorrectly if a function starts from the incorrect code. You can select your critical functions at the Code Protection section. DotFix NiceProtect has the unique feature: the obfuscator of the compiler's data. It is unique because no one of our competitors could present such advanced tool so far! 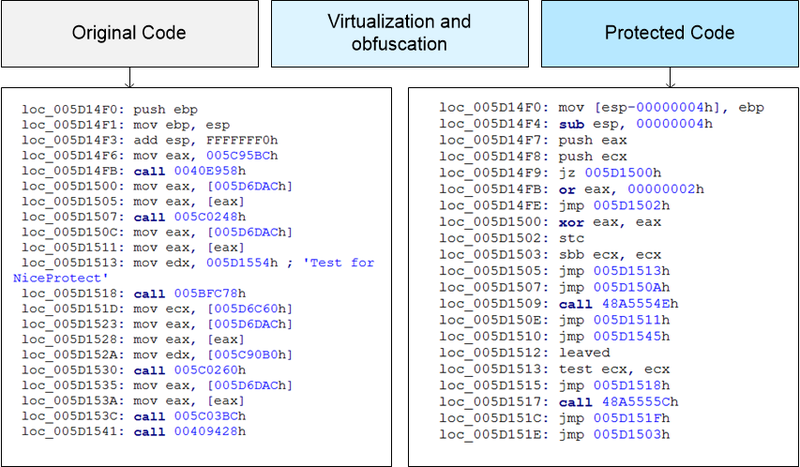 The obfuscation is available for the applications developed with Delphi, starting from version 3 and up to RAD Studio 10 Seattle, as well as for the applications developed with Visual Basic 5.0 or 6.0. After compilation your file contains the names of all forms, controls, events and public functions. Sometime even with prototypes! This information helps crackers to analyze and crack your code. You can avoid it! Just use the DotFix NiceProtect RTTI/VB Obfuscation option. NiceProtect decompiles your code, removes the names of the controls and the functions, and your file can't be analyzed so quickly. The software protection feature increases the size of your file. Just use the software packing option. The packing engine is the additional layer and also contains the anti-unpacking protection. The application's resources can also be encrypted and packed.